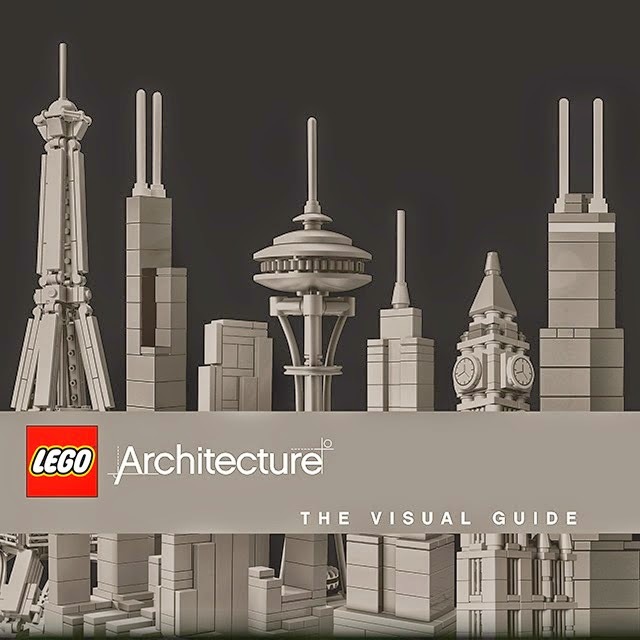 Book Review: LEGO Architecture Archi-new - Free Dwg file Blocks Cad autocad architecture. Archi-new 3D Dwg - Free Dwg file Blocks Cad autocad architecture. On a weekday between Christmas and New Year's, three generations of Hills visited Legoland Florida. It rained on and off that day, and it was cool by Florida standards, but the park was crowded, requiring long waits for the various rides (the ones that were open, that is, with a number of them closed due to the light rain) and for getting to see and do things in other parts of the theme park. A few weeks before that my wife and I tried to take our six-year-old daughter to the Lego store at Rockefeller Center, but the line was just too long, so we opted for the new Madison Square location, which should have similar crowds in the future when more people know it exists. These Lego experiences are two ways of realizing and expressing just how popular Lego is today, even though ten years ago they were "almost bankrupt," according to a quote from the company at Wikipedia. 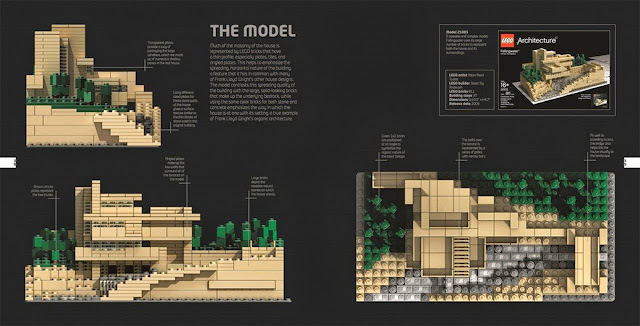 There are a number of reasons for Lego's resurgence, and one of those is tapping into a grown-up market through the Lego Architecture series, which started in 2008 and has been celebrated in a new coffee table book from DK. Before delving into the book, I feel like I should mention a couple things: First, I don't own any of the Lego Architecture sets, due mainly to the fact that I see them as gifts to get others rather than as (grown-up) toys to buy for myself. To date, nobody has given me a Lego Architecture set, so therefore I can't really comment in this review on how the book relates directly to the sets, or how the sets are physically. Two, I went to architecture school with the mastermind behind the series, Adam Reed Tucker (actually, we even went to the same high school, but being different ages we didn't meet until college). My memories of Adam in studio are of someone obsessed with making models. His tastes veered toward Gaudi and Calatrava, and he could pull off well crafted models that weren't just orthogonal boxes or angular forms like the rest of us. That said, even with his penchant for model making, I doubt I or any of my fellow students would have figured he'd become a Lego master builder, or "Lego artist," as he's called in this book. But in retrospect, it all makes sense. 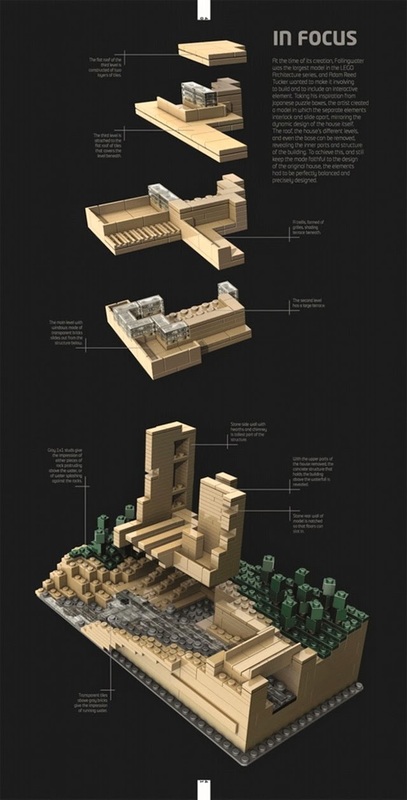 The book documents the 22 Lego Architecture sets that have been released from 2008 and SOM's Sears Tower (called the Willis Tower since 2009) to 2014 and Moshe Safdie's Marina Bay Sands. Most of the sets are credited to Lego artist Adam Reed Tucker and Lego builder Steen Sig Anderson, though other artists and builders have been involved on certain sets and are credited accordingly. 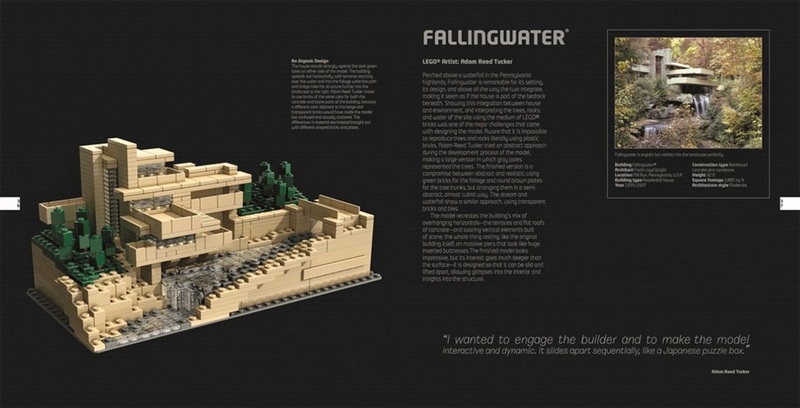 There are certain buildings that lend themselves to being built in Lego, such as Safdie's Lego-inspired Habitat 67, which has not been made into a set, or Frank Lloyd Wright's Fallingwater, which has and whose spreads here show what sort of information is provided for each set: Photos of model relative to original, information on the building, stats on the set, side and top views of the model, and sometimes an exploded axonometric of the assembly. My favorite imagery are the exploded axons, which better reveal the complexity of the models while showing how they are put together; they are clear and detailed enough that somebody with their own extensive collection of bricks could create these buildings without the sets. Unfortunately, the exploded axons are not included for every set. As mentioned, certain buildings lend themselves to Lego Architecture sets more than others. With that in mind, and given my acknowledged lack owning a set, to me the most successful sets are the ones where the differences between full-scale reality and small-scale model are reduced. These include the bundled-square-tube Willis Tower, but not the Hancock, whose angled profile becomes stepped and omits the distinctive diagonal bracing; Fallingwater, which is my favorite set for the way the Lego bricks are used for house, landscape and water; the Empire State Building and Rockefeller Center, whose stepped profiles, like the Willis Tower, work well with Legos; and the Burj Khalifa, which is simply and beautifully executed almost exclusively with round pieces. Even though everybody has their own favorites that are most likely different than my choices, I'd wager that people with one or more sets will find much more to enjoy in this book. After all, it is a celebration of the Lego models as much as it is a celebration of the original buildings, or of architecture in general. Seeing all of the sets documented in one place makes me appreciate the work Tucker and his fellow Lego artists and builders have done to date, but it makes me more excited about what buildings will be added to the series in the future. Will Adam be able to pull off a Calatrava building in Lego?